On an isolated cliffside on the Greek island of Corfu, the Midnight Stars House is a contemporary refurbishment of a former summer home. Composed of two staggered volumes, the continuous arch pattern and monochromatic facade work together to pay homage to the vernacular architecture of the region. White plastered floors and walls on the interior pair with curved ceilings and mirrored finishes to give the previously traditional elements a modern revision. 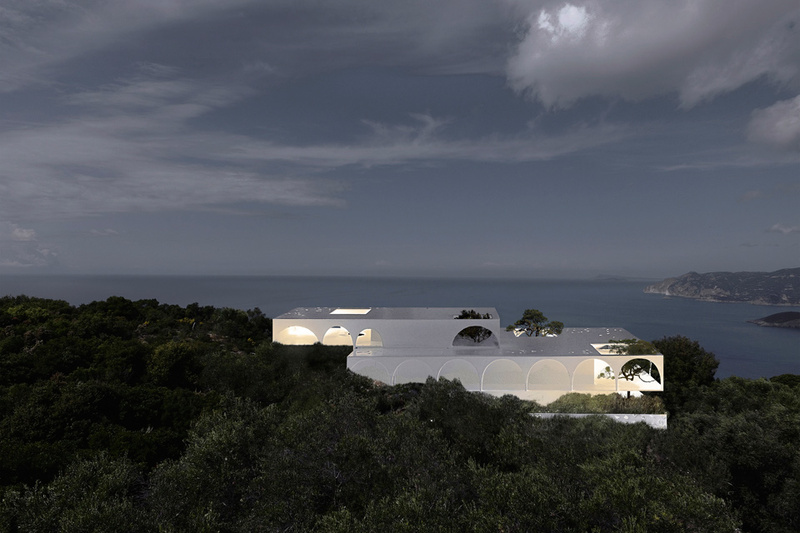 Covered terraces line a concrete patio and lap pool, allowing for undisrupted daytime views of the surrounding olive groves and the Ionian Sea below. At night, the secluded setting highlights overhead scenery created by the evening sky.